This fun-loving family of sports fans were looking for a second home in the city to enjoy front row access to the new Warriors stadium. We created a sleek, modern space that incorporated the client’s favorite color palette of black, white, and grey. 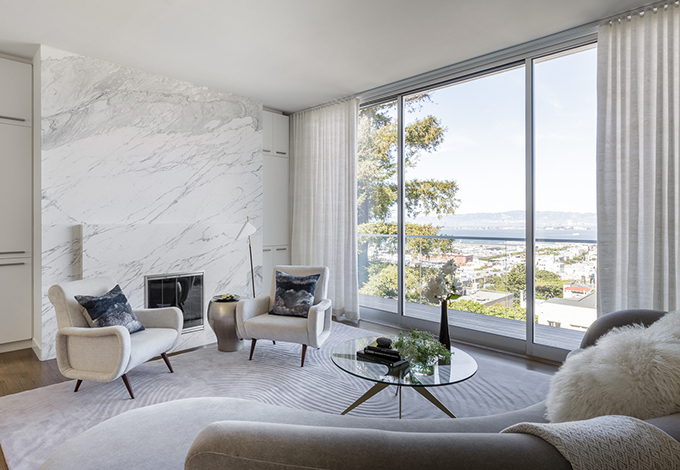 Custom furniture was designed to maximize square footage and to take advantage of the gorgeous bay views. An angled sectional was created to work with the unique shape of the living room, providing maximum seating without closing off pathways to the dining area and bedroom wing. A custom steel and greyed oak dining table provide seating for large groups, with kid-friendly wipeable chairs. A dramatic wallcovering and statement lighting create a moody vibe in the master bedroom. The bespoke bed features petite cantilevered nightstands – allowing us to squeeze in a king sized bed in a small space. We commissioned a local decorative painter to create a graphic mural in the kids bedroom. A custom bunk bed with a trundle accommodates additional overnight guests. They are an efficient, well-organized, motivated group of talented designers who really take the time to get to know their clients. We were pleasantly surprised with how easy the process was.